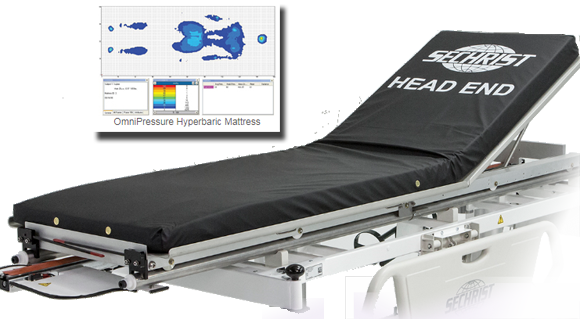 The New Standard in Patient Comfort and Pressure Distribution. Designed for use in high oxygen concentration environments. Three multifunctional configurations for maximum customization to patient’s needs. High-density foam structure supports wound-prevention goals. Fluid and flame-resistant fabric cover. Allows the patient’s legs to be comfortably elevated, eliminating excessive back pressure. The pad is specially designed with depressions to relieve pressure on the feet and ankles, while maintaining the feet in a horizontal position. The Wedge can also be used to elevate a patient’s head and shoulders by placing it behind the back. Relieves back pressure when placed under the knees. It may also be used as an armrest, particularly useful if the patient receives IV therapy while in the chamber, or between the knees when patients are placed on their sides, or simply as an additional pillow. Provides additional support for patients who are placed on their sides. A fabric panel is placed under the patient to maintain the ideal position, while comfortably holding the pad firmly against the patient’s back. The Lateral Support Pad can also be used as an armrest. The HBO2 Patient Comfort Positioning Pads are designed for safety, flexibility and optimum infection control in a high oxygen environment. The high-density foam structure of the positioning pads provides substantial support and even distribution of pressure in support of wound-prevention goals. The fabric cover top is fluid resistant, flame retardant, anti-microbial, self-deodorizing and easily cleaned using certified disinfectants. The Sechrist HBO2 Patient Comfort Positioning Pads can be purchased together as a kit or individually for specific requirements.